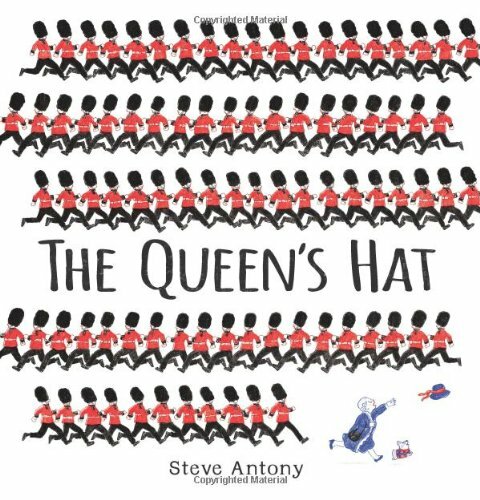 Whither is Her Majesty bound, one wonders, as she sets out from Buckingham Palace sporting a very smart hat and accompanied by a royal corgi? In a flash though, or rather a ‘swish’ she and the hat part company when the latter is whisked skyward by a sudden gust of wind. 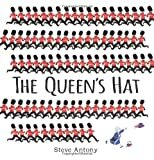 Off it soars swiftly pursued by Her Majesty and a whole troop of the Queen’s men. But the wind is so strong the hat is blown over Trafalgar Square, through London Zoo, along the underground, around the London Eye, across Tower Bridge, above Big Ben, higher and higher and then gently down it floats just out of reach of Her Majesty and all her men, not to mention that corgi. Its landing place? Well just about the most perfect destination you can imagine – right on the head of one small infant in a pram who just happens to be in the gardens of Kensington Palace with his parents.